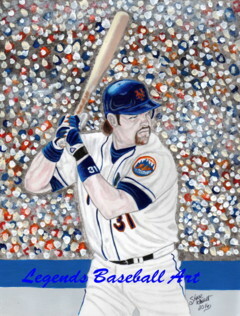 8.5 X 11 inch Limited Edition reproduction prints of my original paintings. I will only offer 20 prints of each of my paintings. After that, they will be retired. Printed on 8.5 X 11 inch, premium, glossy photo paper. Your print will have the "edition" number on the back. For example, "1 of 20". 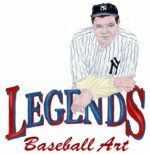 "Legends Baseball Art" will not be on your print. Shipped in a flat, rigid, cardboard photo mailer. Multiple prints can be shipped together at no extra charge. $3.99 Shipping to anywhere in the Continental U.S.
See what's available below. I will be adding many more art prints. Contact Me if you have a request for any player past or present.